I have officially been blogging at ABSeymour for 1 year! I can't believe it's already been a year! To celebrate my 1 year Blogiversary, I asked some great (meaning some big name) blogger friends to help me out with an *awesome* giveaway!! Click on each name to go follow their blog and click on their giveaway item or picture to go follow their TpT store and then enter the Rafflecopter! ANY 3 items from my TpT store! Click on the picture to choose your 3 items! 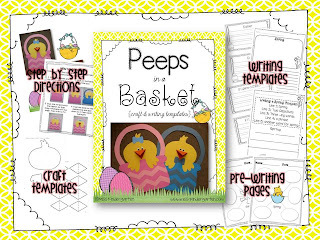 Hadar from Miss Kindergarten is donating her Peeps in a Basket Spring Craft and Writing Templates which is adorable! 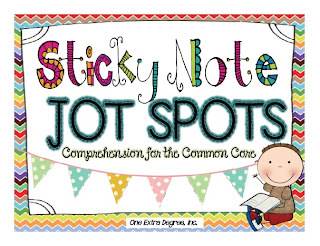 Amanda from One Extra Degree is donating her new Sticky Note Jot Spots. I have already used this with my reading groups and it was a HUGE hit!! Kelley at Teacher Idea Factory is also giving away any 1 item in her TpT store! Now, go enter in the Rafflecopter below to win these great prizes. There are lots of ways to enter so good luck! The giveaway ends next Wednesday, March 27 at midnight so I will announce a winner next Thursday. Congratulations, a year flies by. Just started spring break today. Already took my first nap, now the cleaning begins. My spring break was awesome--I stayed home and went to Siesta Key Beach!! I am going to be visiting family! Great giveaway! I'm going to relax. We went camping for a couple of days and have been painting and staining our kitchen cabinets for the remainder of the week. Living in chaos right now but making good progress! Congrats on your year! Great giveaway! I'm going to China for Spring Break, can't wait. Nothing fun on my list...taxes, heading to school one day to tackle closets/cupboards and other fun things. I will be relaxing at home with my babies sneaking in some time to watch soap operas:). Thanks for the opportunity! Congrats!! How exciting for you! And my spring break is O to the V-E-R. It was a nice, relaxing week at home! Congrats Rachel! I remember when you included me on my very first linky party just about a year ago! Wow, did that year fly by! :) Here's to another successful year! Stop by my blog for a HUGE giveaway!! We did yardwork, planted some new beautiful blooming plants and went to some free music during SXSW! I am going to spend time with my family! Congrats! I did some Spring Cleaning! Not too fun but it was something I needed to do! Thanks for the great giveaway! I visited my sister and my new niece! I will be relaxing at home with my daughter who is coming home from college! Thanks for the giveaway! We do not have a spring break until the middle of April. We actually have a break in February and another in April. This is such a great give away!! I got to sleep in and do some shopping. We had our break last week and I slept in every day! Congratulations! We have three days of school this week and then I am headed to South Carolina for some warmer weather and fun! I got to go home to Wisconsin for my break! So nice! My spring break is next week. I will be spending quality time with my daughter and catching up on school work! I'm going to Denver to see my niece! I'm SO excited! We are staying home.. spring cleaning here we come! I have been doing some relaxing and my hubby and I are going to getaway without the kids for a couple days!! Hope you are enjoying your spring break! Great giveaways! On my spring break, I worked and updated some of my resources for student teaching. It wasn't really the break I had been hoping for when most of my friends went someplace warm and sunny.